All the Graco car seats have been designed with adherence to the American Academy of Pediatrics (AAP) and National Highway Traffic Safety Administration’s (NHTSA) guidelines. Graco car seats comes in various models and makes to suit yours and your baby’s needs. If you have more than one car then the Graco click connect car seat provides one-step secure attachment to the Graco car seat base making it fast and safe. 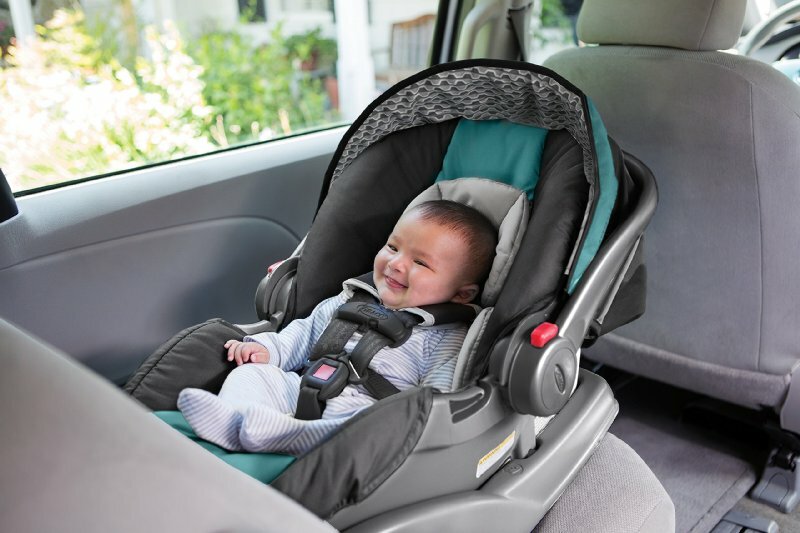 This rear facing car seat is ultra-lightweight and can accommodate 4-30lbs infant up to 30inches. It comes with a removable newborn head support cushion. The latch equipped stay in car Graco car seat base allows easy installation each time. Graco’s SnugRide enhanced with the click connect technology is an ultra-lightweight infant car seat that allows for easy transit of the seat from the stroller to the car. The five-point harness keeps the baby safe and secure throughout the ride. It comes with a rotating canopy to shade the baby from sunlight. The Graco Milestone All-in-one car seat has been designed to fit the seating needs of your child as he grows. This all in one car seat has three-stage seat in it that allows rear facing seating for 5-40lbs child, a forward facing seat for 22-65lbs child and a belt-positioning booster which accommodates a 30-100lbs child. It has a 4-position recline which helps to keep the child comfortable in both the forward and rear facing mode. The seat covers are washable and the plush inserts are washable and removable. The Graco milestone all in one car seat is facilitated with a Simply Safe Adjust Harness System which is safe and simple. The frame of the car seat is reinforced with steel which provides additional durability and strength. The EPS energy absorbing foam helps to manage impact energy. This is indeed a forever car seat for your child that can be used for 10 years. It is designed to support a child from 4-40lbs in the rear facing mode and a forward facing mode for toddler up to 65lbs. This light-weight car seat has boosted seats in high back from 30-100lbs and backless from 40-120 pounds beat positioning modes. The InRight latch system allows for a fast and easy 1 second attachment. The Simply Safe Adjust harness System allows adjusting the harness and the 10-position headrest together. The Graco 4Ever 4-in-1 Convertible Car Seat is facilitated with a 6-position recline that helps to keep the child safe and comfortable at all times of the ride. The Graco Double Stroller and Car Seat combo comes in multiple designs to suit your requirements the best. The Graco Double Stroller and car seat combo comes in the FastAction 2.0 travel system that allows fast one second fold making it easy for you. The click connect system allows easy and secure attachment of the car seat to the stroller. The multi-position reclining seat helps to keep the baby comfortable as he grows. The Graco combo with the jogging stroller and travel system is just the right combination for parents who love to take their child out while jogging. The air filled tires allows for a smooth ride for your baby while you jog. Its features like one-hand one-action fold helps to operate the stroller much easier. The click connect attachment of the car seat ensures complete safety of the baby while you drive. There are various versions of the jogging and the travel system combination that are designed keeping in mind the fast and busy life of every parent. It is not always possible to have more than two car seats in a car due to the bulkiness of these seats. In response to the struggle with the car seat, Graco has come up with the silm fit car seats. With the Graco Slim fit carseat it becomes easy to accommodate the car seats without any issues. These narrow versions of the Graco car seats have the same safety features that are available in all the rest of the car seats by the brand. It comes with 3 modes; rear facing, forward facing and highback booster seats. It has 2 recline positions allowing easy head and neck control for children of all age groups. It can support 5-40 pounds in the rear facing mode, 22-65lbs in the forward facing mode and 30-100 pounds in the high back booster mode. The Graco slim fit car seat comes equipped with all the easy to handle features the only difference from the other versions is the width of the seat which is much narrower than the other models. It does however seat your child comfortably and safely. The safety and comfort of your little one is of utmost importance. Especially while driving it is absolutely important that your child is seated securely to counter any sudden movement or jerk that could otherwise throw him off the seat. Graco understands that safety is nowhere more important than in a car. Although all the design and production of every baby product is guided by strict government rules, Graco ensures that it takes extra safety measures to exceed the standards and give the extra protection that you are looking for. Graco has its own crash test facility in Georgia that allows it run crash test and impact throughout the development of the Graco car seat for your child. Graco ProtectPlus Engineered is a safety standard that is a combination of the most rigorous car crash test that it carries out in the crash test facility. The designs are tested out with the 5-point harness system and in the high-back belt-positioning modes for frontal, side, rear and car roll impact as well as extreme interior temperatures.